Here we are in 2017, and I sincerely wish you all a joyous new year. My hopes for the new year are a little muted, professionally at least. For one thing, my union is still run by an insular group of people with astoundingly poor judgment, and no amount of egregious errors will persuade them they've ever made even the tiniest of mistakes. There are a lot of people who will cheer their actions no matter what their implications, and most of them are on the payroll one way or another. I go to meetings and watch certain people roll their eyes as we speak, but I am nonetheless a staunch supporter of union. Leadership can roll their eyes when we speak, and invent ridiculous excuses for their lack of commitment, but those of us in opposition understand the value of union. That's why we see "right to work" as such a scam. And make no mistake, those who opt out of paying for union services hurt all of us. The idea of right to work is that no one should be forced to join a union. That idea is absurd because no one is ever forced to join a union. They can opt out, but if they do they still have to pay a fee for services union provides for all. Those services include negotiating on our behalf. Now I will admit that I don't think UFT leadership does a very good job at this. But on the other hand, they keep getting elected and it is not entirely their fault that three out of four UFT members can't be bothered to check a box and walk to a mailbox to vote. Of course it's your right and mine to disagree with leadership. You may have even seen me doing so once or twice on this space. Nonetheless, union is our right, organizing is our right, and going hat in hand to ask Mike Bloomberg or Rudy Giuliani for a raise is not anything I'd want to do alone. Right to work supporters disagree. They think they should reap whatever benefit there is from union membership and that payment for such benefits ought to be optional. If that is what's right, that is what's right. In fact, incoming President Donald J. Trump supports "right to work" as well, and he plans to appoint Supreme Court justices who will make it national policy. Now perhaps you believe that is a good thing. Perhaps you believe that Donald J. Trump is looking out for working people when he does stuff like this. If you believe that, I congratulate you, because you are surely in a better state of mind to begin 2017 than I am. Of course, based on that line of thought, as someone who supports Donald J. Trump not at all, I ought to be able to opt out of paying taxes. It is really inconvenient to see all those deductions on my paycheck. Since I don't support "right to work," since I don't support any Trump position I can call to mind, and since I don't expect him to represent me or anyone I care about, I ought to be able to opt out of federal taxes. After all, Trump seems not to have payed them. The problem is, though, that he still seems to think I should pay. That's unfair, of course. But aside from the fact that he has one set of rules for himself and another for working people, if I can't be compelled to pay union dues, I ought not to be compelled to pay taxes either. If there is no responsibility attached to being part of one community, why should there be any attached to another? If I can rightfully expect the United Federation of Teachers to work on my behalf with compensation being optional, why can't I expect the same of the United States of America? The answer, of course, is that people like Donald J. Trump don't want us to organize against ideas that hurt us. They do want us, however, to be compelled to support the very same government that fights against our interests and impedes our right to organize. 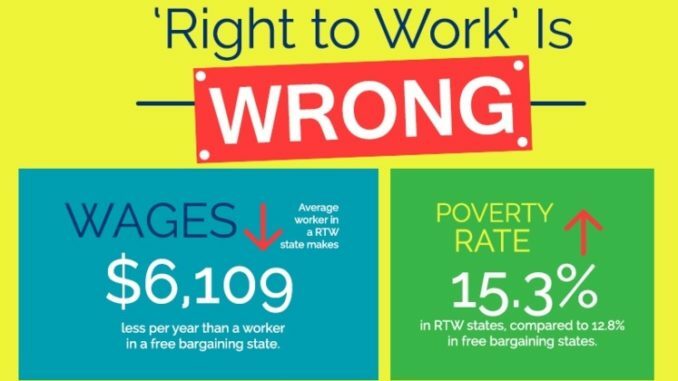 If you support "right to work," you may as well support more work for less pay. I don't support that, and I therefore don't support the legislative priorities of Donald J. Trump. But he's out to weaken us and our unions, and there's no way he's gonna let us off the hook for supporting such counterproductive priorities. Because he and his BFFs are so incredibly greedy and selfish, they don't even understand that hurting and discouraging a middle class is not healthy for this country. As long as he doesn't have to pay taxes, he couldn't care less about those of us who do. 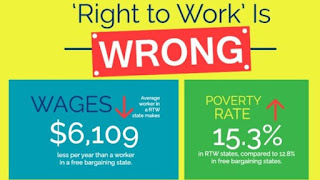 If you believe that weakening union via disingenuous policies like "right to work" are the way to go, and you think paying taxes is different in any way whatsoever, you're laboring under a serious misconception. When Donald J. Trump makes federal taxes optional for all of us, instead of just billionaires like himself, then I'll be happy to listen to him extol the virtues of optional union membership. Until that moment, you know as well as I do that he's moving us back to the 19th century and that we're gonna have to repeat struggles we thought were over for decades just to get back where we were last November.